Experience WOW Result in weight loss, in forming new habits, or in your overall health. Before we dive into the program details, Let me introduce myself. I’m Rachel Moore and I am married with four sons. I wear many hats and one of them is Coaching where I inspire others to transform their desires into reality. If you choose to get started today, I will be your “Food & Fitness Coach” over the next three months. Natural Body-Building Competition. Surprisingly for me, I won two trophies when I placed 4th in the Open Bikini Competition (all ages), and 1st place in the Bikini Masters (ages 40 and above). For many years I have practiced having a healthy, fit body through moderate exercise. However, even though I am petite with a small frame, I still had belly fat issues. A couple of friends who are professional bodybuilders challenged me to compete in the all-natural bodybuilding competition. I hired them to train me. That challenge pushed me beyond limits in my body where I discovered new strengths and potential. goal, but discovered new potential. After surpassing my goal to lose belly fat and to firm up my abs, I transitioned into living a Low Carb lifestyle which helps me maintain what I worked so hard to attain. Since that lifestyle transition, I experienced a transformation in forming new cooking and eating habits. Through my journey to find delicious recipes that fit my food cravings, I discovered recipes that not only taste good, but they also keep your body in a fat burning state so that you can keep off the weight. Allow me to coach you to reach your fitness goals. During that fitness challenge, I learned fat burning secrets that bodybuilding athletes incorporate within their training on a routine basis. 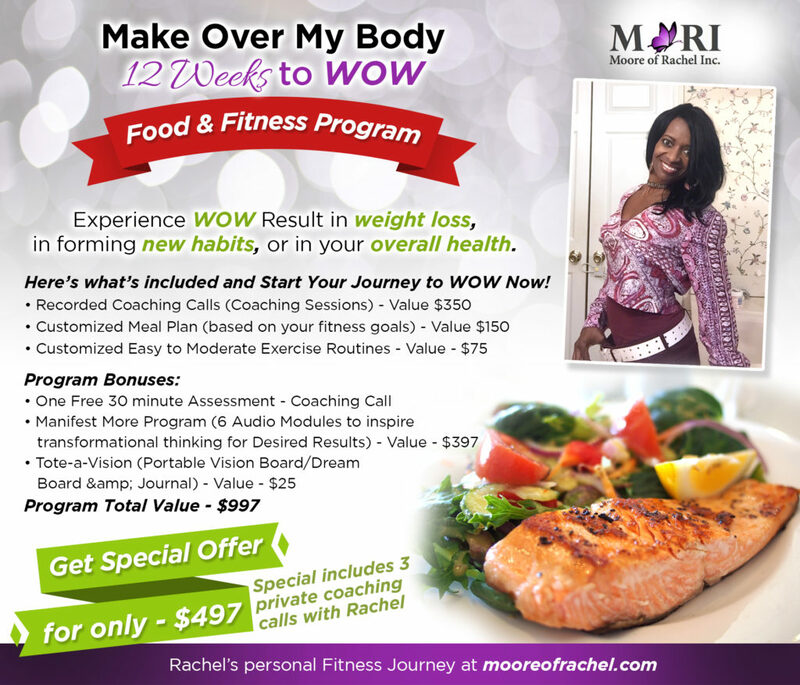 I will share those secrets with you during the 12 weeks to your WOW. I will also share other great things that I’ve learned about Low Carb Living. This Special Offer is for a Limited Time, so Get Started Today! After you select “Add to Cart” and finalize your purchase, you will receive details on how to schedule your initial Assessment Call with Rachel. It’s your time!